ANICETUS, a native of Syria, St. Anicetus served as eleventh Pope of Rome from either 150 or 157 until his repose in either 153 or 168. During his Pontificate St. Polycarp of Smyrna (23rd February) came to Rome to settle with him the question of the date of Easter. Whilst St. Anicetus agreed to allow the Eastern Church to continue its practice of celebrating Easter on the 14th day after the first moon of the vernal equinox (14th of Nissan on the Jewish calendar) even when it did not fall on a Sunday. This was a temporary agreement at best, as the complex question as to how to calculate the date of Easter vexed the Church both east and west for at least seven more centuries. St. Anicetus was also a tenacious defender of the Church against Gnosticism. He has been listed as a martyr for centuries, most likely due to the common belief that all early Popes of Rome were martyred. However, there is no evidence to support this assertion. DONNAN (DOUNAN) and COMPANIONS, a disciple of St. Columba (9th June) at Iona, St. Donnan was the founding Abbot of a monastery on the Isle of Eigg, off the west coast of Scotland. His attempt to enlighten the Picts of the region resulted in St. Donnan and over fifty of his monks (some sources say fifty-one, and others as many as one hundred and fifty) being martyred by Picts on Easter Sunday. Most sources list the date of their martyrdom as being around 617, and based upon the connexion between St. Donnan and St. Columba, it is safe for us to place the date at the end of the sixth, or beginning of the seventh century. DRITHELM, St. Drithelm, when ill and close to death, experienced a terrifying vision of damnation, and a beautiful vision of salvation. St. Bede the Venerable (25th May), in his Historia Ecclesiastica , describes these visions in detail, and relates that St. Drithelm actually died in the night, coming back to life in the morning to tell all that he had seen. Following this event, St. Drithelm relinquished all material things, dividing his property between his wife, his children, and the poor. He then retired to Melrose Abbey where he received monastic tonsure, living a life of penance and strict asceticism until his repose circa 700. ELIAS, PAUL, and ISIDORE, St. Elias, an elderly priest in Cordoba, and two of his disciples, SS. Paul and Isidore, were martyred by the Moors in 856. 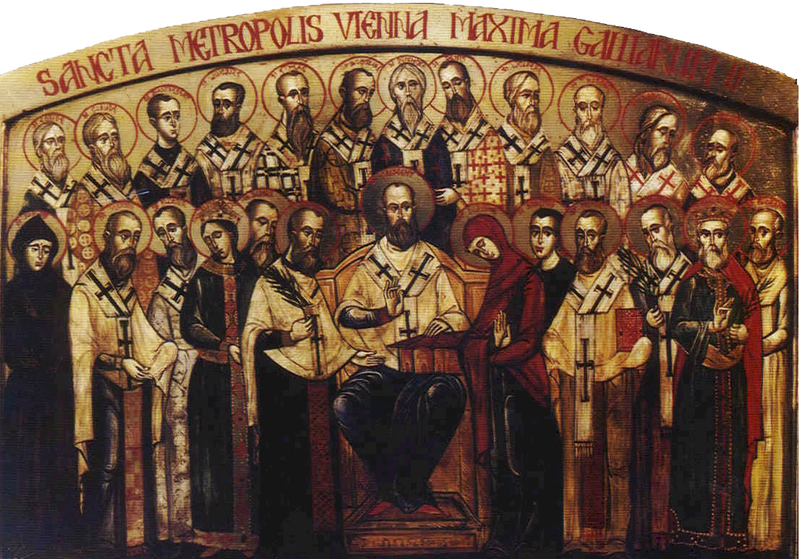 An account of their martyrdoms was written by St. Eulogius (11th March) who witnessed it. FORTUNATUS and MARCIAN, (Date Uncertain), two martyrs of whom nothing is known. According to some martyrologies, they were martyred in Antioch, however, most list North Africa as the location, which is probably more accurate. INNOCENT of TORTONA, a Christian man in his early twenties, who was arrested and scourged during the Diocletianic Persecution. He miraculously survived, and following the Edict of Milan (313), St. Innocent was ordained to the priesthood, and circa 326 consecrated Bishop of Tortona. LANDERICUS (LANDRY), (Seventh Century), the eldest son of SS. Madelgarus (20th September) and Waldetrudis (9th April) and Bishop of Meaux from 641 until 650. Following the repose of St. Madelgarus (650), St. Landericus resigned his bishopric to be his father’s successor as Abbot of Soignies. MAPPALICUS and COMPANIONS, a group of martyrs in Carthage, who were tortured to death in 250 during the Decian Persecution. PANTAGATHUS, a nobleman who was a diplomat and courtier of the Court of King Clovis I. Resigning his worldly positions, St. Pantagathus was ordained to the priesthood and later consecrated Archbishop of Vienne. St. Pantagathus reposed in 540. VILLICUS, Bishop of Metz from 543 until his repose in 568. WANDO (VANDO), Abbot of the Abbey of St. Wandrille in Fontenelle, Normandy. St. Wando was forced to live in exile in Troyes following being falsely accused of a now unknown misdeed. Fortunately, the allegation was later found to be false, and St. Wando was reinstated as Abbot of Fontenelle remaining there until his repose circa 756.